Loss of identity, role, control and social isolation, is commonly experienced by people who have experienced a brain injury. These losses become the focus of people’s lives after they transition from acute rehabilitation and transfer to community based rehabilitation. At this stage it is important to remember that people tend to compare their current situation to the lives they had before their brain injury. i.e. living independently or working as a teacher with a large social network. The clinicians at NRG understand that specialist neurorehabilitation is important but it must be facilitated in a way that is meaningful, improves the quality of life (QoL) and empowers the client to take control of their life again. Identifying and achieving functional goals is the process used to achieve this, but what are functional goals? Functional goals are, put simply, what that the client wants to achieve. Goals should support and encourage people to engage socially and outside their home environment. These goals are identified by the client during the initial assessment process where clients are asked “what would you like to be able to do at the end of this period of rehabilitation?” The options here are endless and can range from being able to go back to work to going fishing. The most important factors are that the goal has to be meaningful to the person being supported and that it can be achieved. Our vision is for our child to live a happy and fulfilled life with all the support he needs to manage his complex needs. We are delighted to say that this aim has been greatly served by the work of Tracey Dailly and would have no hesitation in recommending her services to those who may need professional Speech and Language Therapy directly or related consultancy advice. Thank you very much. 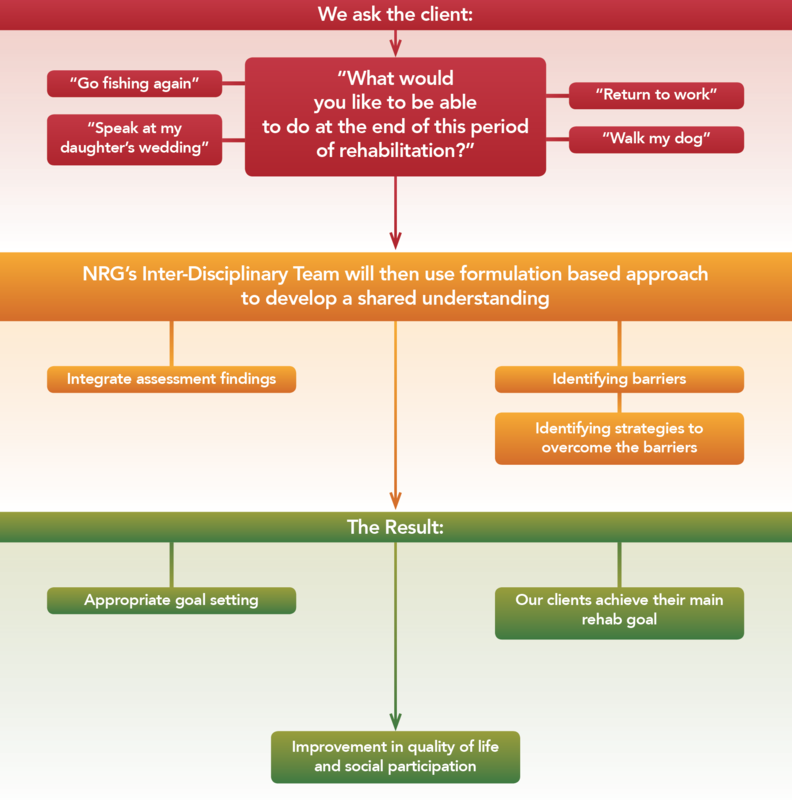 The interdisciplinary team (IDT) at NRG help clients achieve their goal by using a formulation-based rehabilitation approach that has the client’s goal as the central focus. A formulation approach is used as it allows all members of the IDT to integrate their assessment results. This is not only to develop a shared understanding of the barriers that are preventing the client from achieving their goal/s, but to identify strategies that could be used to overcome them. This forms the foundation for setting appropriate intermediate goals that will eventually support the client to achieve their main rehabilitation goal. For example, Lucy is a 22 year old who suffered a road traffic accident. She has made a good recovery and is living in a bungalow supported by support workers 24/7. She is happy that she has moved from a inpatient care setting and is now living in her own home, but feels she has no quality of life. Her friends are either working or studying. Some are in relationships, but they all have a large network of people they spend time with. Lucy did have contact with her friends but she was reliant on them visiting her. Lucy wanted to have more control and wanted something meaningful to do and to aim for. With support from the clinicians at NRG, Lucy identified her goal as going college to complete an access course. Lucy was supported to also identify how she would like the therapy team to support her to achieve this aim. Lucy identified that her aim from her Physiotherapy sessions was to be able to walk into the classroom and not use her wheelchair. Here, the Physiotherapist identifies the barriers that are preventing Lucy from achieving this goal i.e. currently needs one person to support her to walk. The physiotherapist then works on rehabilitation intervention that will allow Lucy to walk unaided into the classroom. The same principles are applied to other areas of therapy. For example, Lucy also identified that she wanted her Occupational Therapy sessions to focus on identifying a suitable course and to support her with learning at college. Moreover, she wanted her Speech and Language Therapy sessions to support her to communicate with her teacher and peers without relying on communication devices. All this information was formulated by the IDT team to identify suitable intermediate goals. The goal setting process is then used to provide the plan and review process, that will then monitor the success of the rehabilitation process. It provides each member of the interdisciplinary team with a common focus and allows the client to know how far they are from achieving their goal. This therefore facilitates the process to be collaborative, as everyone involved is working towards a shared goal. Each client’s needs and goals are different, therefore the formulation and goal setting process is unique to them. The clinicians at NRG are skilled to provide a bespoke rehabilitation plan. We believe that this rehabilitation approach enables people to reach and maintain their optimal physical, sensory, intellectual, psychological and social functioning level more effectively, as they are in control of their own rehabilitation journey. “People with long-term neurological conditions living at home are to have ongoing access to a comprehensive range of rehabilitation, advice and support to meet their continuing and changing needs, increase their independence and autonomy to help them to live as they wish” (Page 35, The National Service Framework for Long Term Conditions, Department for Health, 2005).